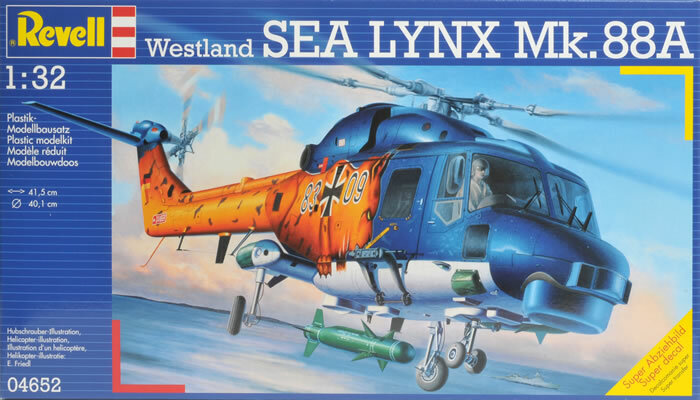 The only 1/32 Sea lynx on the market, and it’s incredible value for under £ 20. For some, the lack of raised rivet head detail. The Sea Lynx Mk.88A is a third-generation naval Lynx, upgraded for export to the German Navy featuring Gem 42 engines, under-nose radome with a 360° traverse Marconi Sea Spray 3000 radar, dipping sonar, BAe Matra Sea Skua anti-shipping missiles and on some airframes a multi-role turret (MRT)with forward looking infra-red (a GEC MST FLIR in the nose). The German order consisted of seven new build helicopters plus conversion of the remaining 17 original Mk.88s. The first Sea Lynx Mk.88A bound for the German Navy had its roll-out in July 1999. The aircraft are based at Naval Air Wing 3, Nordholz and are flown by 3rd Squadron. The Sea Lynx are embarked aboard the F122, F123 and F124 class frigates. I guess first impressions should always count, and WOW what a first impression the Revell Westland Sea Lynx Mk.88A leaves you with. 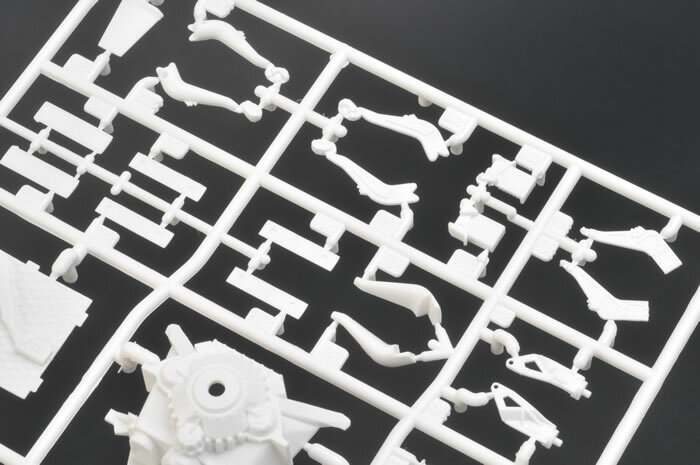 You are confronted with a massive end opening box (I’m not a huge fan as I like to store the completed sub-assemblies in the box) that is weighty and get this; we modellers talk about sticker shock, but in this instance it’s in your favour, yep at Hannants you are looking at £19.99 for EU prices. 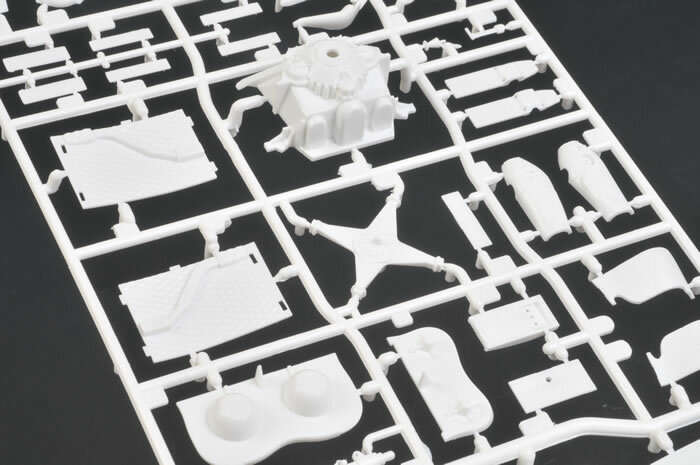 When I saw what Revell has delivered for the price, I was bowled over. Let’s have a look at what’s in the box. 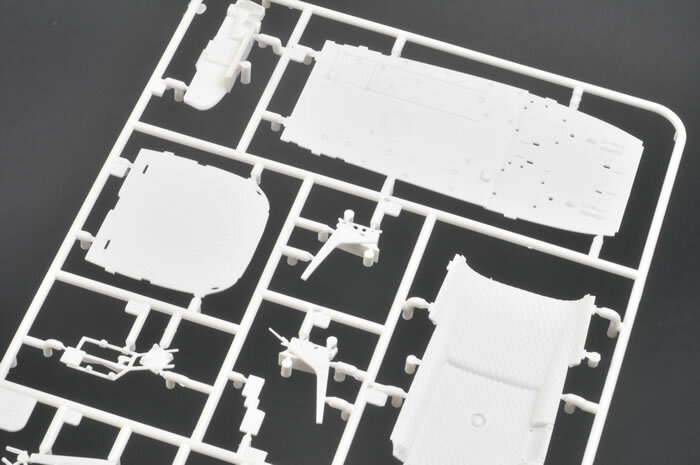 You get five bags containing 18 Sprues, a 19 page instruction booklet and a single large sheet of decals. 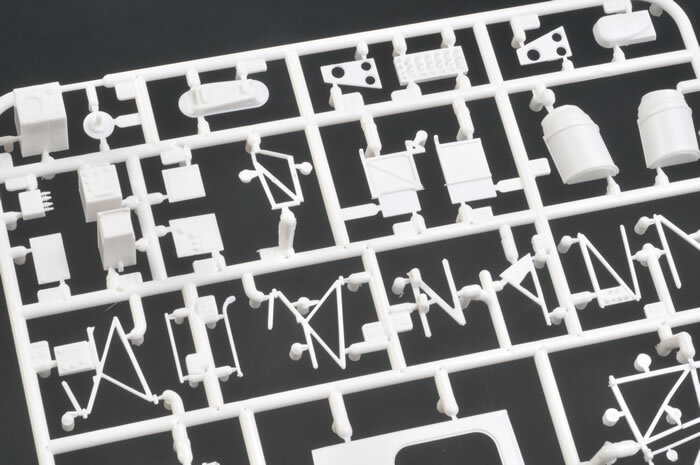 Apart from the clear plastic, all other plastic is white, possibly not a favourite choice for my old eyes, as looking at the plastic if find it difficult to see the detail and part numbers ( it’s like skiing in a whiteout). 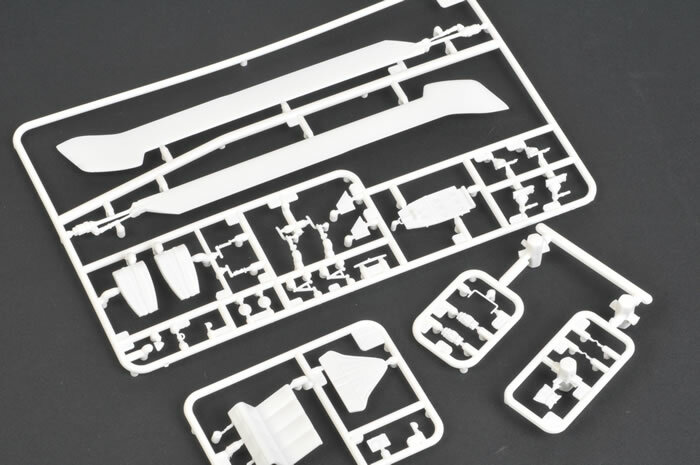 Unlisted nor referenced, but supplied in the box are Sprues Q, K x 2, J x 2 and H (clear). That leaves L, M, N missing, hopefully these are reserved for future releases i.e. a Royal Navy Sea Lynx HMA.8, among others. 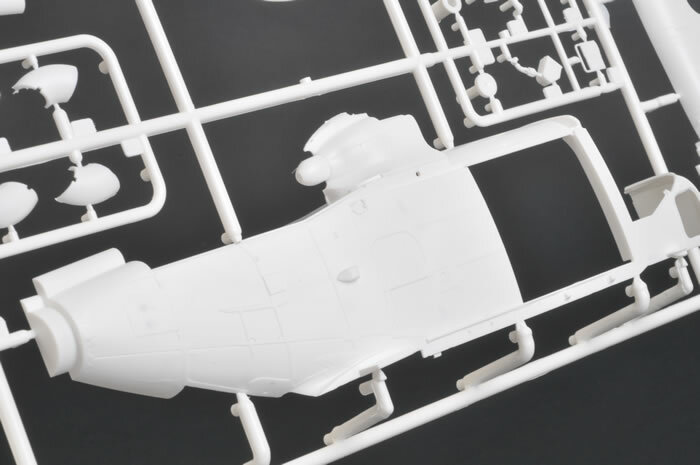 I’ve mentioned the unlisted sprues early on because as I did more research, I discovered that you can and need to use these extras to accurately complete you Sea Lynx Mk.88A. 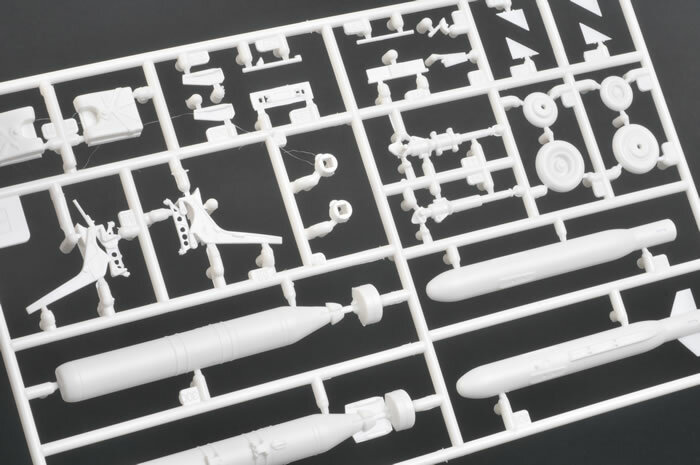 Sprue Q contains parts to complete a Sea Owl thermal imager modified nose (HMA8), Older instrument panel, rescue hoist, folding tail, ALQ 144 and various antennas and avionics panels. Enough of the detective work and let’s look at the construction sequence. 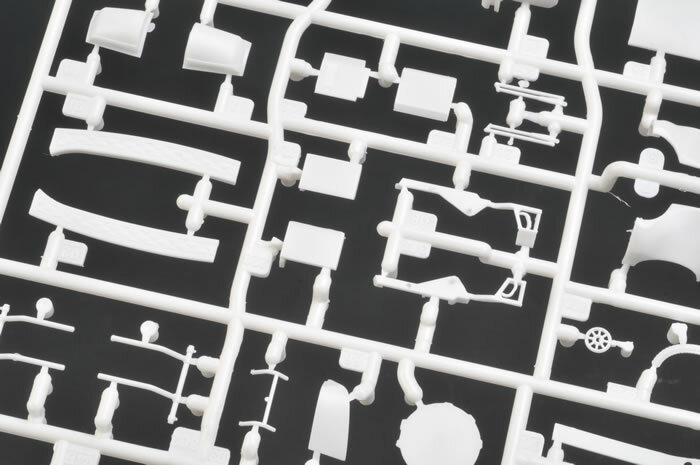 The instructions come in the standard Revell format with colour call outs referenced throughout for their brand of paints. 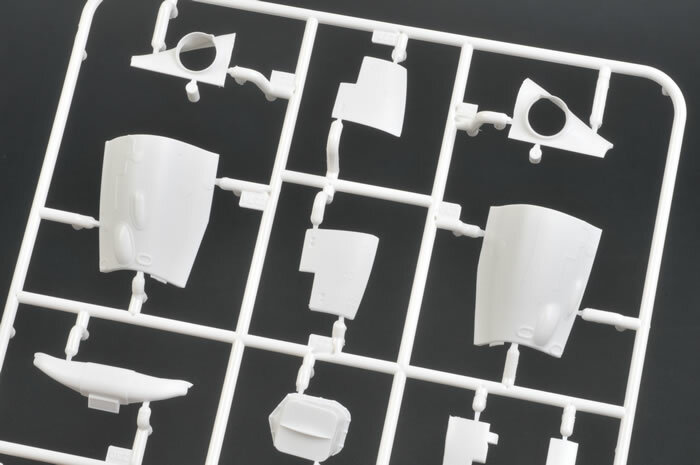 If Revell is not your paint of choice, colour conversion charts will help you out here. Before you begin you will need to decide if you wish to build an Anti-Submarine Warfare aircraft with AN/AQS-18D dipping sonar and its associated equipment, or an Anti-Piracy aircraft armed with the 12.7mm door gun. Construction begins with the cockpit where depending upon your final option, determines what holes need to be opened in the flooring. The instrument panel (part 148A) at step 5 is correct if you are building an Mk.88A with the FLIR on the nose (I have seen images that look to have an unspecified [not the Sea Owl] type of FLIR fitted). 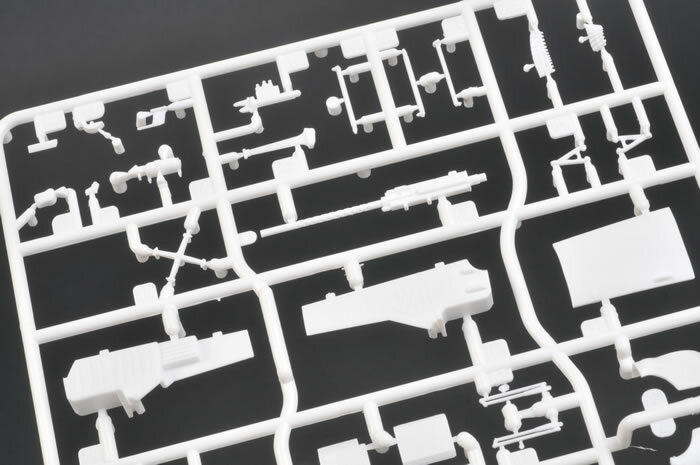 For the aircraft on the decal sheet use the instrument panel part 236A of sprue Q. 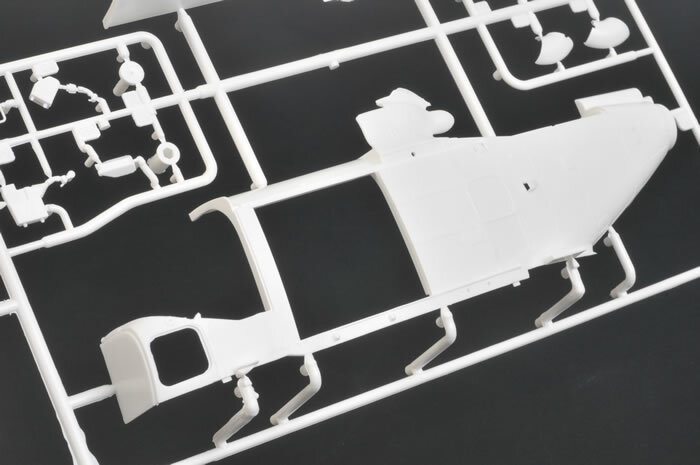 Both instrument panels have some minor indentations within one or two instruments that will need some attention before the decals are applied. I guess the point I’m making is, use your references, as the centre consoles in images I have seen have a single Comm. Nav. Interface (CNI) panel top left. While the instruction show the use of dual CNI. 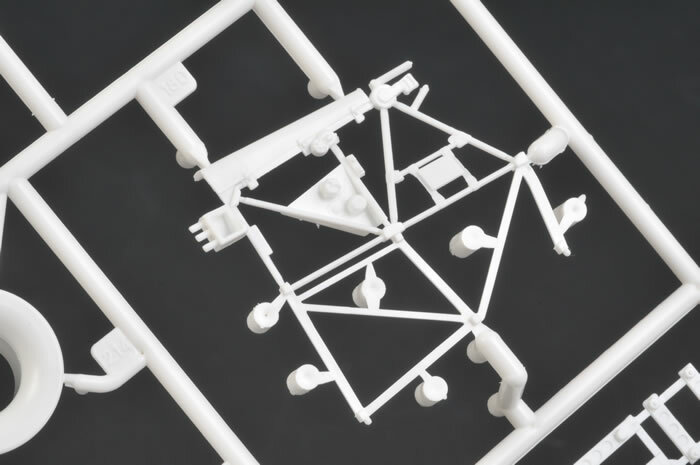 Sprue Q again has the parts required to revert to single CNI. 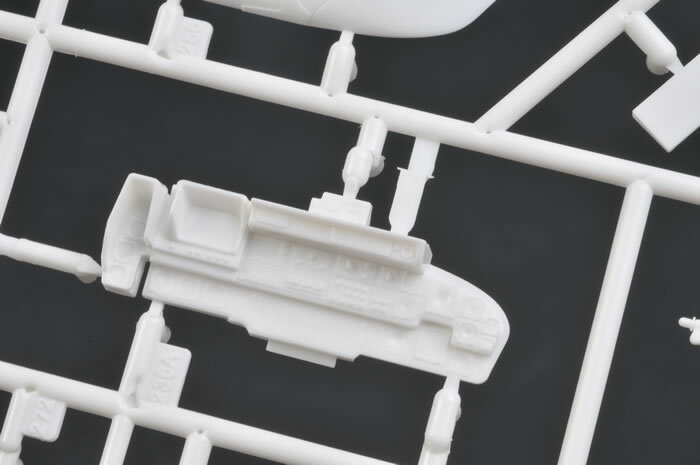 When completed, the cockpit will look great, as the level of detail in the plastic when painted and decaled will certainly stand out. From the cockpit, construction continues to the AN/AQS-18D dipping Sonar and all its associated equipment. Two whole pages are devoted to the construction of the sonar equipment. Again the detail is superb and will look spectacular when painted. 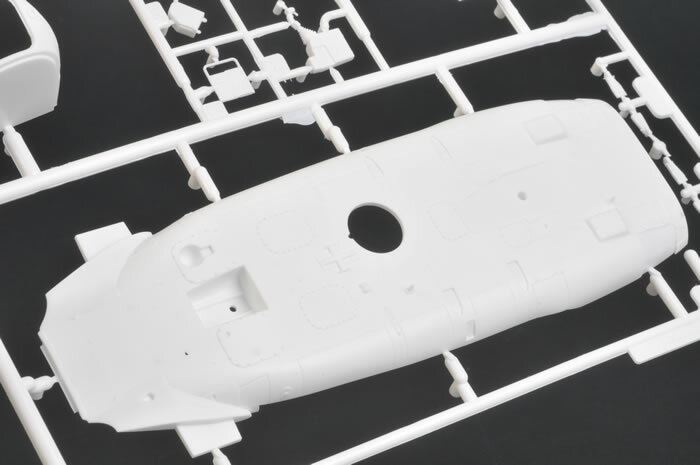 From this point on we begin to close up the fuselage and then add all the external equipment, antennas, floatation equipment and electronic counter measure modules. There are no engines to speak of just the inlet and exhaust that are both blanked off far enough back so as not to be an issue. 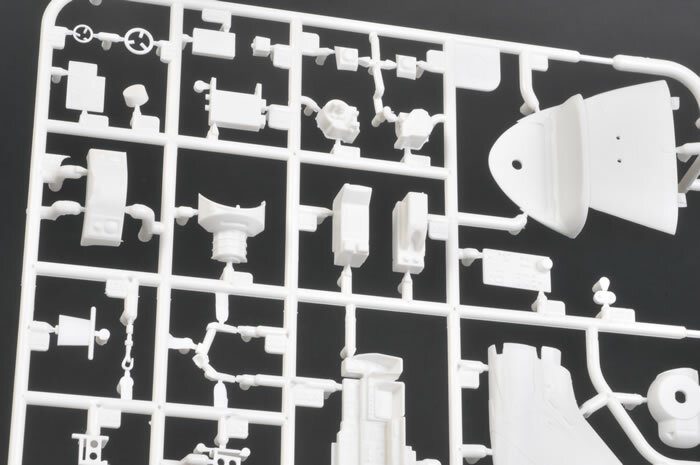 Not in the instructions, but included on a spare clear sprue (H) are the inlet mesh guards. 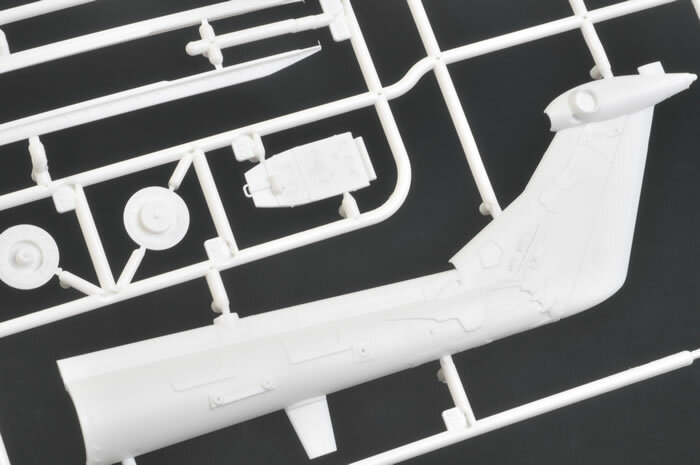 At this point we move onto attaching the tail boom, and possibly the one area that will create discussion. Sea Lynx are covered with numerous reinforcing plates. 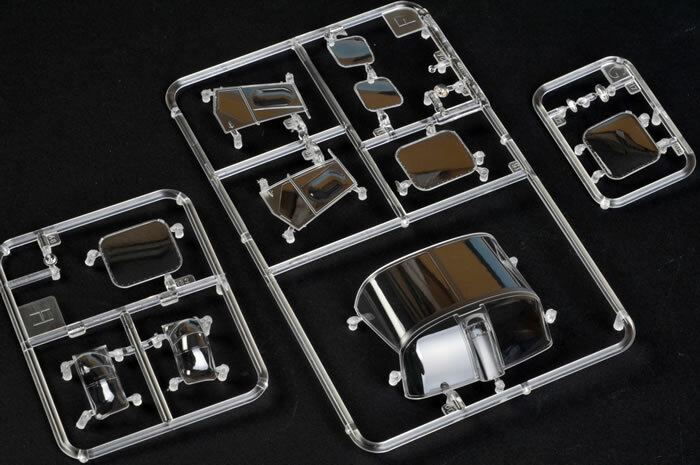 These and the main aircraft panels are secure by 1000’s of dome head rivets. 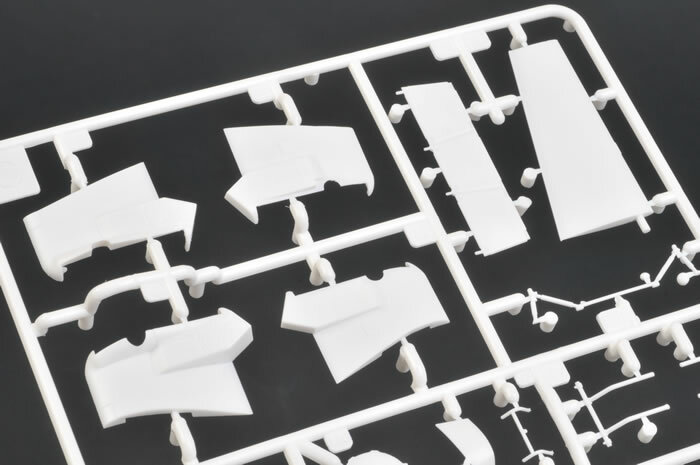 These rivets do not appear on the Revell Sea Lynx exterior, I can only assume that a conscious decision was made to not include this detail. Does this lack of detail detract from the overall kit? 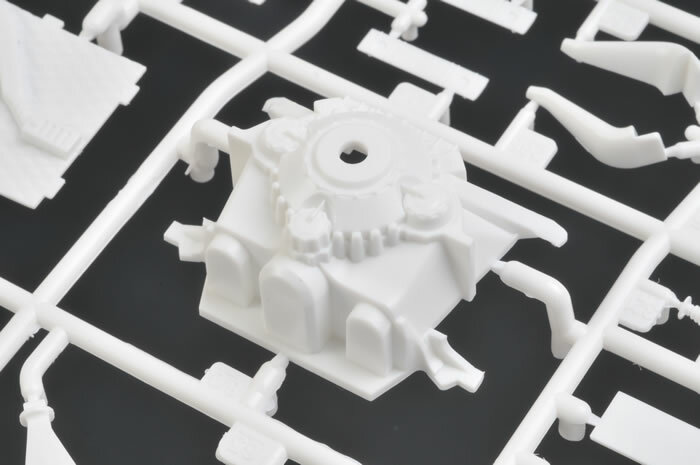 Given the price and overall high level of detail, I don’t think so, and if you wish to super detail (as many will) there are options available to replace the rivet detail. I personally feel that under the 25th Anniversary markings you may not notice the lack of rivets. 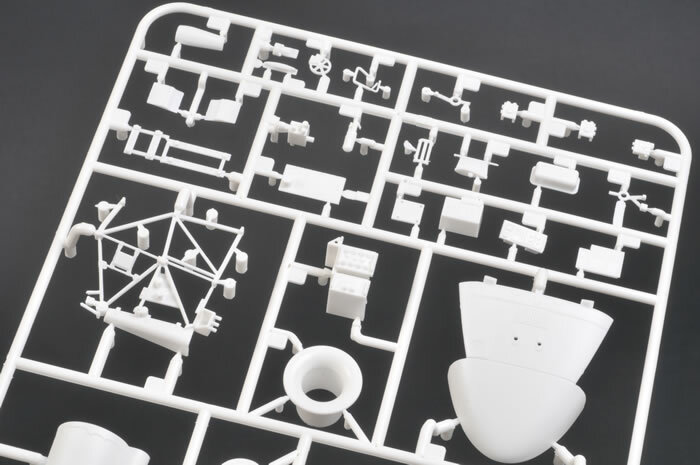 Various air vents are mould into the kit with no openings. One option will be to cut these vents open and insert fine mesh from behind. Construction now moves onto the door gun and associated weapons prior to beginning the rotor head construction. 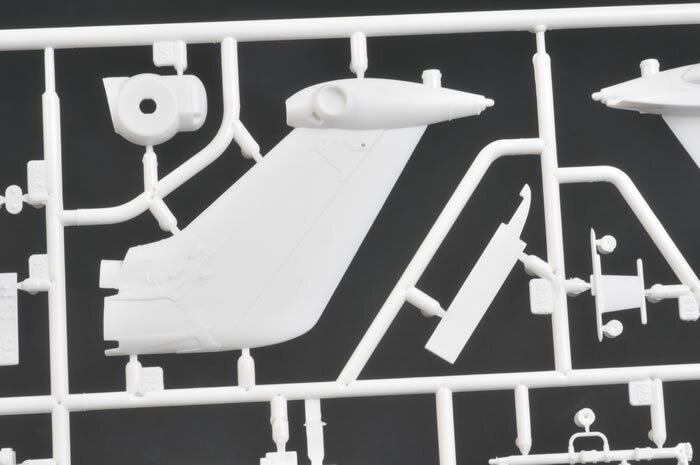 There is currently no option to build the Sea Lynx with the rotor blades folded, but what is nice is that the head is detachable. With the head done, we are finished. The decals are printed in Italy; all appear in register and are very legible. 83+09 is a very brightly decorated aircraft with a gloss night blue forward fuselage that merges into an orangey/yellow lynx that extends down the tail boom. 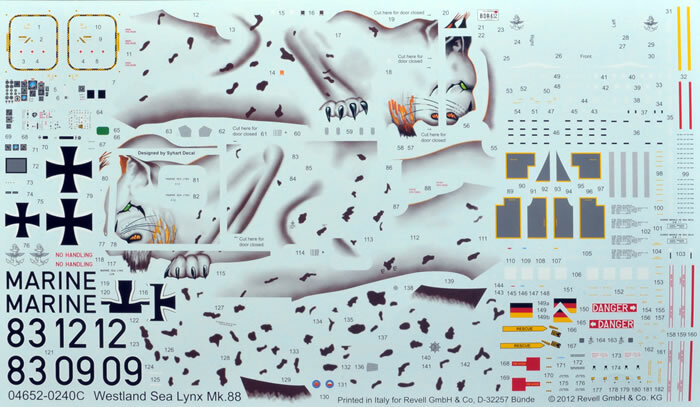 Scale templates are provided for 25th anniversary of Sea Lynx operations. These when cut out can be attached to use a paint masks, a very nice touch. The other option is a standard dark grey upper with light grey lower. 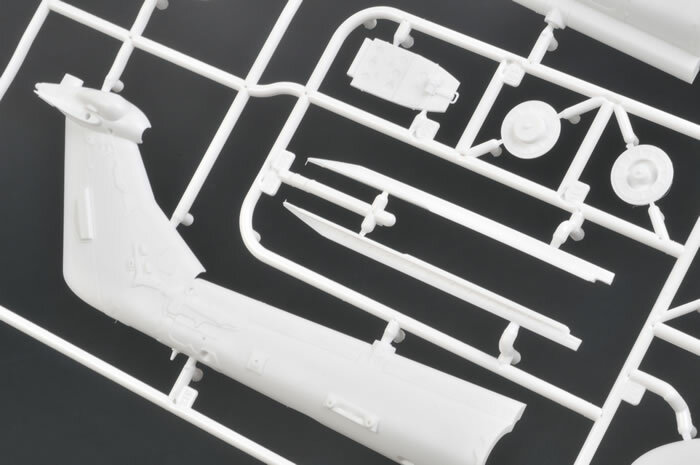 Revell has certainly come up with a winner here, okay, the lack of raised rivet detail will generate discussion, and so for those that wish to add this, there are options available. 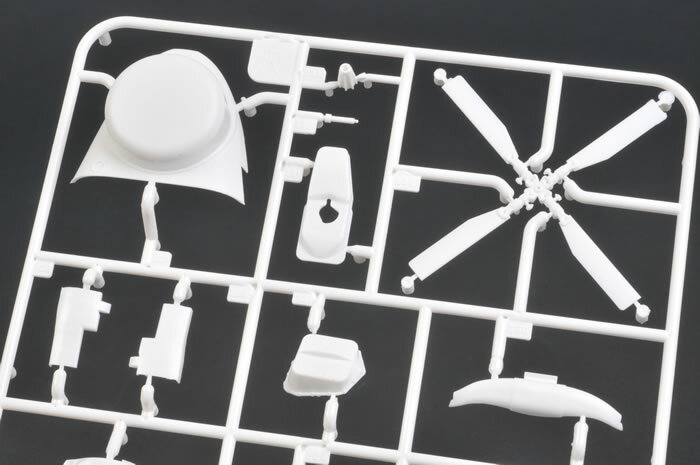 Looking at the sprues provided in the kit, this will not be the only Super Sea Lynx that Revell will release. I feel you could come very close to a Royal Navy HMA.8 aircraft and other variants of nationalities that use similar Super Sea Lynx. For £20 from Hannants this will certainly be a very popular kit; a great level of detail, eye catching markings and priced to suit all budgets. Get one for yourself, hours of fun for 20 quid. We are all looking for value for our modelling dollar (£, €, etc. ), and this is it.